Our mission is to foster our Masonic values in our community. We seek to meet our members' needs, to promote fraternal ties, and to make the world a better place, one Mason at a time. Our Lodge welcomes good men and provides them with opportunities for personal growth and development in a stable, safe, caring, fraternal atmosphere. We offer our members and their families the opportunity to meet each other socially and to build and renew lifelong friendships. We are a light in our community, reaching out in ways that will improve people and enhance their lives. Are you on Facebook? Please like our page. Mark your calendars for the Rusty Trowel on February 28th! Event is open for Masons, friends and family. There will be the Rusty Trowel program for Masons and a program for friends/family. Dinner will be served at 6:30pm. Events start at 7:30pm. Afterwards will be libations and refreshments at 8:30pm. For more information call 760-398-5057 or email at rusty.trowel.in.the.desert@gmail.com. 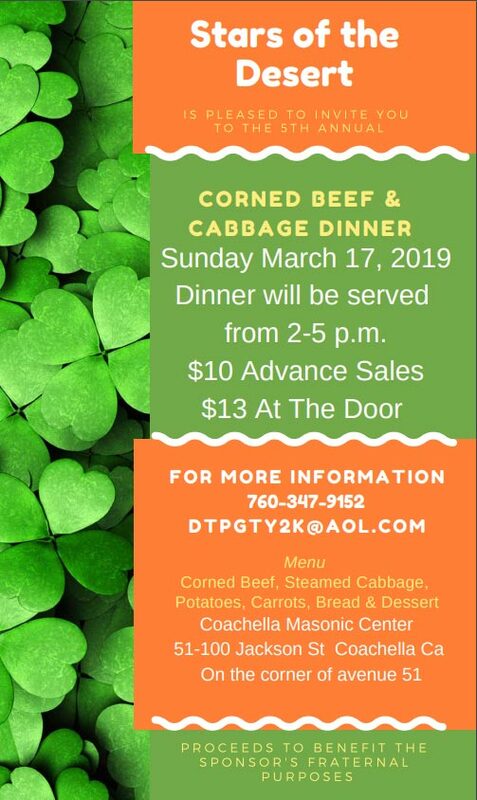 You are all invited to the Coachella Valley Order of the Eastern Star's 5th Annual Corned Beef & Cabbage Fundraiser. Mark your calendars for Sunday March 17th, 2019. Dinner will be served 2-5pm. $10 in advance and $13 at the door. For more information call 760-347-9152 or email at dtpgty2k@aol.com. UPDATE: See the photos from the 99th Installation of Officers by clicking here. Come to the Coachella Lodge 99th Installation of Officers and Christmas Party! Details below, click on the banner to download the flyer.